What is a domain name? What can I do with a domain name? What is a domain name & what can I do with a domain name? What is a domain & what can I do with it? A domain name is an address that people use on the internet, whether for websites or for email. It's a string of characters which usually spells out a word, a company name or person's name. 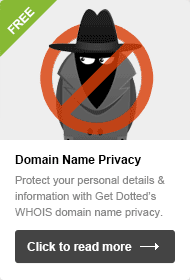 You can buy domain names from a domain registrar such as GetDotted.com, and they can be incredibly useful things (see below). There are many different types of domain names available to purchase, so check out our domain types and prices page to find out more. These days, buying domain names is almost as common as buying a new app or video game. At GetDotted, you can pick up your very own .co.uk domain name for a little more than the price of a pint at your local, and believe me, it could become worth a lot more! Register your domain names from £4.26! Register domains with GetDotted and take advantage of our free unlimited services including unlimited free hosting, website and email. Use the box below to search for domain names. Just enter a word of your choice and click search. Alternatively, you'll get some great domain name suggestions using our free domain name generator! Why buy a domain name & what can I do with it? There are lots of things you can do with a domain name. We've picked out the most popular, and likely reasons for wanting a domain name below. Another frequently asked question is 'What is domain name hosting?' 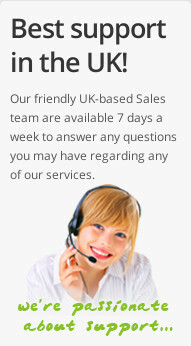 so you might want to take a look at our domain hosting page. By the way, if you haven't got your own website up and running already, you'll find great ways of getting your own website with your GetDotted.com domain, regardless of your 'skill' level. Find out more. You can of course use a domain name for email addresses. There are many free email providers out there (such as Hotmail, Yahoo, Gmail etc.) but it's incredibly difficult to find a good address that hasn't already been taken by somebody else. Instead, you'll be left with something similar to '[email protected]', which is neither catchy nor particularly professional if you're running a business. An email address such as [email protected] would be far more impressive approach for your business email. 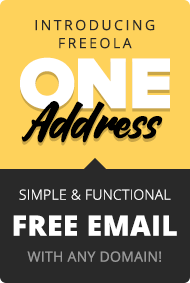 Freeola allows you to setup unlimited mailboxes at every single domain, so you can have addresses for everyone in your family or office. Awesome! Find out more. One of the most compelling reasons to purchase a domain name is to protect your identity. One of the most popular reasons for buying a domain name, is to register yourname.com, or yourcompanyname.co.uk, regardless of whether you intend to use it or not. While this is a great reason to buy a domain name if you ever want to use it in the future, it also prevents competitors or other people from registering your identity, and trading off your identity (or even something a little more unsavoury). Go ahead, search for your company or family name using the search box below. Domain names have become increasingly valuable over the years, as the 'better quality' domain names become registered. It's now as rare as gold dust to be able to register one word domain names that feature in the dictionary, making them potentially incredibly valuable if you manage to get your hands on a good one. Since 2014, many new domain name types have been launched, so even if you can't find your ideal domain with a classic domain extension, its worth checking out the new domain types. There are many, many sites offering people the ability to sell their registered domain names. Take a look at the our Domains For Sale page for example, where you'll see hundreds of domains listed for sale by GetDotted customers. As an example of a recently sold domain, viewit.com sold for $40,000, and was probably only registered for a few quid. There's no limit to the worth of a domain name. Different domain names are worth more to different people (in a similar way to car number plates), regardless of whether they are a dictionary word or popular phrase. As mentioned above, protecting your identity is one of the best reasons for buying a domain name for the reasons stated, but also because a domain name with your name or company name is surely invaluable? A steady increase in popularity of more peculiar domains such as flickr.com and digg.com suggests it's well worth trying some more 'random' ideas! Search for your domain using the box below. Search, Find & Register Domains!